I’m tired. It’s been a week of ups and downs. This is therefore a bit… stream of consciousness. It started on a down with the death of the hard drive, as immortalised in my previous ‘Hard Drive Lament’ entry. It dragged me back, kicking and screaming, from my previously easily attainable February target. Let me just digress for a moment or two on the subject of targets. I’ve discussed them before in depth, but just to recap. Take that, air, you sunnovvabitch. After the hard-drive death, that attainability became less likely and I’ve been totally putting myself through hell over it. And here’s the really weird thing: I have no idea why! It’s not like I’m not well within the overall target or anything. But I have this near OCD-like need to reach (and exceed) that February target. As a result, I may have been pushing myself a lot harder this past week than I would otherwise have done. Not that this is particularly bad, or anything. Well actually it is bad. I work full time. Coming home and writing until my eyeballs threaten to pack and leave due to being so tired hasn’t done me any favours this week. But I’ve caught up. At least, as much as is humanly possible. February’s target is now back in my grasp. I am off work Tuesday and Wednesday. Hopefully at some point in the next three days, I’ll achieve Target Nirvana. The air will suffer more punching. So that’s a kind of up-down thing; both good, bad and frankly, bloody silly. But that’s what I do best. Let’s look at the UP of this past week, because there’s been a damn sight more of it. Aaron and Katie’s baby showed up on 21st February. After countless months of referring to their unborn child as ‘she’, they were probably somewhat alarmed to discover that ‘she’ was in fact a ‘he’. Alexander is no less gorgeous for the fact and little boys are the stuff of legend. (I may have a certain bias in that direction; although I was convinced Smallish was going to be a girl as well). There are very few things in the world as uplifting as the joy of a friend becoming a parent. They have all the tough early days and nights ahead of them, but all of us Experienced Parents know that it doesn’t last. I wish them every joy and happiness in their new family unit. I predict Alexander will commence his efforts to take over the world in approximately five years. I predict he will be successful in six. Warhammer 40,000 celebrated its 25th birthday on Saturday 26th February. To mark this occasion, the Black Library released a special anthology of short stories called ’25 for 25′. 25 short stories all collected together in one place. Works out at… whatever it is. Something like 56p per story, which is frankly a bloody bargain. I am thrilled that one of my own short stories, Bitter End featuring everyone’s favourite deranged villain Huron Blackheart is one of those stories. It’s an ebook download which you can get here – no worries if you don’t have an eReader, simply acquire yourself a bit of free software like Adobe Digital Editions (free) and you can still enjoy it. I heartily recommend At Gaius Point by Aaron Dembski-Bowden – that’s been one of my favourite short W40K stories so far. The subject of eReaders and the attitude of folks towards them may be the subject of a future rant, incidentally. It’s Black Library Live! 2012 this coming weekend (March 3rd). Lots of people gathered up at Warhammer World and taking over the tables in Bugmans Bar to talk about All Things Warhammer. I’m taking part in no less than three of the discussion panels (Space Marines, Warhammer Fantasy and Hammer and Bolter) and am looking forward to it enormously. The last two years have been great fun; but this will be the first time I’m there on the ‘other side’ of the table. If you’re going, I look forward to seeing you there. Among the pre-release books available on the day is the four-book anthology Architect of Fate which contains my novella Accursed Eternity. Despite being off work for a week, I got caught up again. Huzzah for that. Additionally, I am in tomorrow (Monday), but am then off for the rest of the week. Such a nice warm feeling. Mmmmmm. So yes. This week has been a bit of a wild ride, but I always liked roller coasters. Occasionally though, it’d be nice to be cruising along on the flat for a while. Mind, that’d mean life was boring, and mine’s been anything but that over the last three years. Additionally, how much fun does this roller coaster look? This entry was posted in General, Writing and tagged Accursed Eternity, Black Library, blather, I'm an author now, life, W40K, weekend, WHF, work, Writing. Digital media is the work of the devil! (Just to pre-empt the rant). 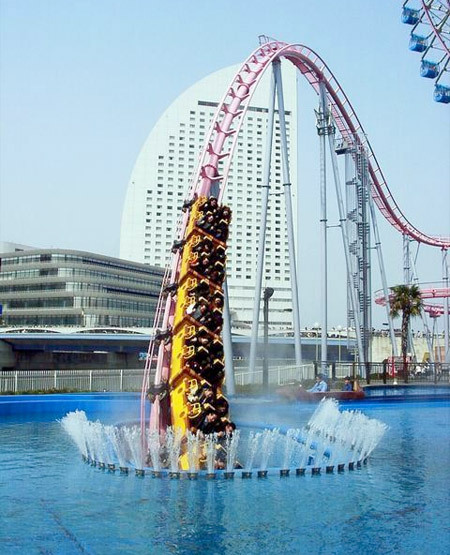 If that roller coaster is in Tokyo (and it looks suspiciously like the one in Tokyo that I rode on 2 years ago), it was hella fun, if short, but the seats were not made for, shall we say, people with caucasian asses. I thought they were going to need the jaws of life to get me out, lol.